The device claims to be the world's smallest 4G capable smartphone. Measuring in at 1.7" by 3.6" by 0.5", it can accurately lay claim to that title. Talk about a pocketable phone. While the average screen size of smartphones has been steadily increasing over the past few years, there are still those that yearn for a highly mobile device. That’s where Jelly comes in. 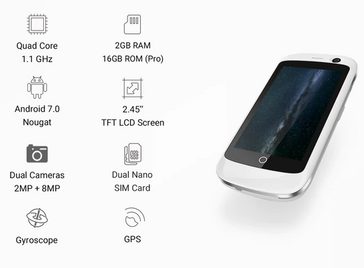 Unihertz, the startup behind the tiny phone, is currently raising funds on Kickstarter. The Jelly comes in two flavors, a standard version and a Pro model. The standard Jelly packs a quad-core 1.1 GHz processor, 1 GB of RAM, 8 GB of storage, and a 2.45” TFT LCD touchscreen with a resolution of 240x432. 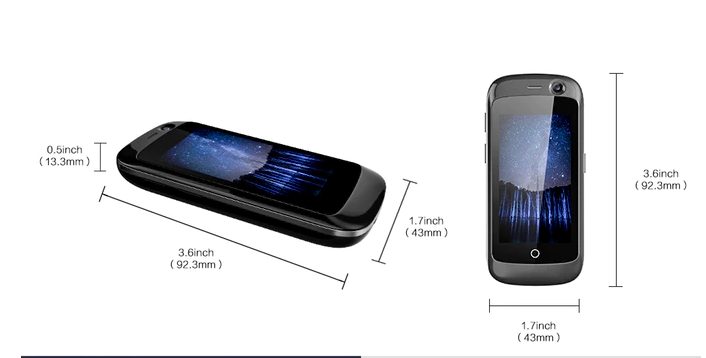 The Jelly Pro keeps the same processor and display but has 2 GB of RAM and 16 GB of storage. Both also have support for up to 32 GB of expandable storage (via microSD), dual nano-SIM card slots, a 2 MP front-facing camera, and an 8 MP rear-facing camera. Powering everything is a removable 950 mAh that Unihertz says can run the phone for “3 days working time” and 7 days of standby time. Perhaps most impressive is the software. The Jelly runs a modified version of Android 7.0 Nougat and has full access to the Google Play Store, meaning that it should be able to run any Android app. The phone is also able to connect to 4G GSM networks. All of this is packed inside a battery that measures 1.7”x3.6”x0.5” (WxHxD). The Jelly is currently available as a preorder on Kickstarter with prices varying on different tiers. Unihertz expects to start shipping the device in August of this year.